Now there is a gap between the opposing supporters which can be patroled by Police and Stewards with normal height barriers. The removal of the barriers come with the approval of the police after an improvement in behaviour from Cardiff City supporters. 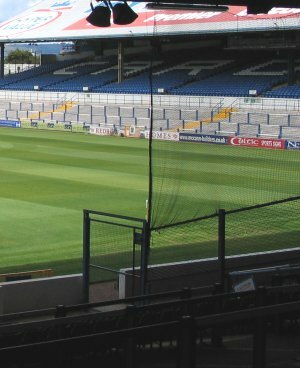 Cardiff have no worse a problem that most clubs and as such we can come in line and not have such high fences and curtains (pictured right before their removal). Speaking to the BBC today Gwyn Davies, of the Valley Rams supporters club, said: "I've been coming here for 40-odd years and I can't remember the last time there were no fences. "In my lifetime, I've seen the fences go up with the start of hooliganism and now, hopefully, I've seen the end of them. "We want to encourage away fans to come here because it generates atmosphere, which is what football's all about." Fellow City supporter, Paul Corkrey, added: "We're fed up with our reputation at City and it's time things changed. This is a step forward." Chief Superintendent Bob Evans, of South Wales Police, said no special measures would be put in place for Saturday's visit of Burnley to Ninian Park in the Championship. He said: "We will be monitoring the situation and offer stewards help if they need it." Mr Evans added that taking the fences down was a "symbolic" move, reflecting the improved behaviour of fans. He said: "Cardiff City's fans hadn't been the best behaved in the country, but we would give credit for the progress that has been made. "For me, taking the fences down is a win-win situation. "Fans get a better atmosphere to watch football, the club's family image will improve and if behaviour improves further, we will be able to take officers away from Ninian Park on match days and put them on the streets of south Wales." The next three Cardiff City home matches will also see a leafleting campaign run by police and the club calling for an end to offensive chanting and "hostility towards the away fans". Deputy chairman, Peter Ridsdale, said: "We stamped on violence here and now want to stop the obscene chanting and vitriol towards visiting supporters. "The fences coming down and the leafleting campaign are all part of a package."